Till now, the dual SIM phone market was restricted to feature phones and low quality phones. Motorola might change this trend soon. 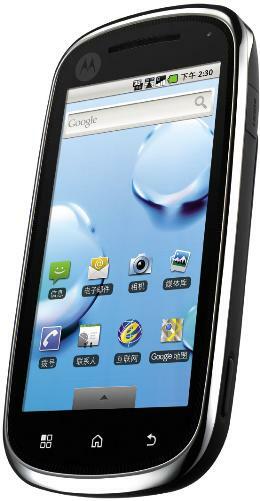 There are reports that Motorola may release an Android running (Eclair, 2.1) dual SIM (GSM+CDMA) phone in India. Currently sold in Korea as Zhishang, this phone may get the name Glam in India. And it is not just another low features Android device. A 3.7” 480×854 pixel resolution capacitive touch display with gorilla glass, 720p playback on external TV/monitor through HDMI port, Wi-Fi, 5mp camera with dual-LED flash, 720p recording (at 24 fps), GPS are just a few yummy features of this phone. Powered by a 550MHz TI OMAP processor, the phone has 512MB of RAM at its disposal and there is 1GB of user memory (microSD expansion available). The phone is just 11.7mm thick and weight decent 137 grams. So, if you are one of those who love dual SIM phones, this could be the saviour to put you out of misery (of using useless phones).